This Bible, like all books in Hebrew, reads from top-to-bottom, but also from right-to-left. 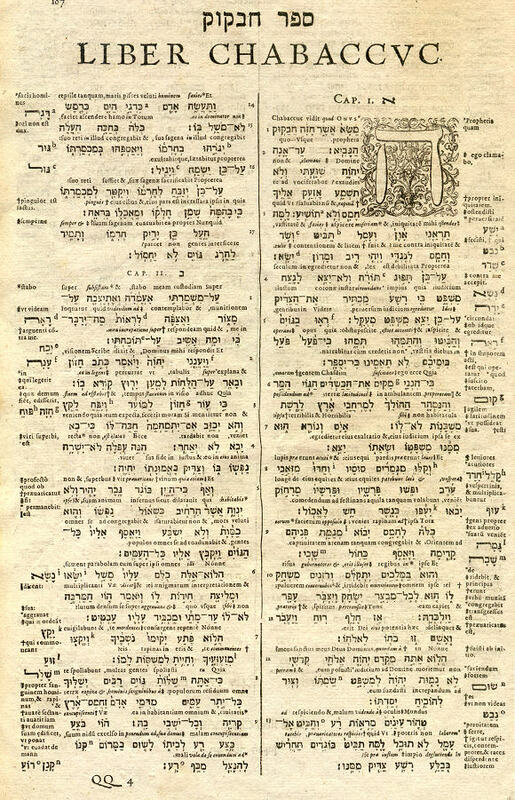 The right column — with the large, engraved Hebrew letter "He" — contains the first 13 verses of the Book, and then continues in the left column. Each line was also read right-to-left, but since I can't read Hebrew, I guess that doesn't affect me much. Verse numbers are placed on opposite sides of the center vertical line. This kept them out of the way of the marginal notes. There are actually two different sets of notes displayed in the margin. The notes in Latin are directly from the Vulgate Bible; between these notes are alternative readings in Hebrew.